Radio Drom department head says IDF has no solution to Hamas threat, as residents report their homes shake from the underground digging. Amnon Sofer, a resident of the Gaza Belt region and head of the news department on Radio Drom, is working to collect testimony from residents who hear the sounds of underground Hamas tunnel digging from their homes on a daily basis. Speaking to Arutz Sheva, Sofer explained that he took it on himself to raise the issue to the daily agenda on the radio channel, as the apparent digging continues and officials claim the sounds are not digging to calm residents - without explaining the source of the noise. "For 15 years we (at Radio Drom) are accompanying residents of the Gaza Belt, it started with missiles and moved to tunnels. We know for sure that the residents are hearing digging, it's happening in Sderot, in Nirim and Nir Am." Sofer said "the IDF doesn't have a solution now for this threat. If God forbid a tunnel popped up suddenly and terrorists came out of it and committed a massacre, they would launch a large operation. And we ask why don't they launch an operation before it happens?" The question comes in the wake of an exchange between Opposition head MK Yitzhak Herzog (Zionist Union) and Prime Minister Binyamin Netanyahu on the issue this Sunday, when Herzog accused the government of waiting for the terrorists to use the tunnels to attack Israeli civilians. Radio Drom hosts MKs and ministers frequently to ask them what is happening with the tunnel threat, says Sofer. "Some of them tell us that we need to rely on the IDF, but the fact that we're raising it to the daily agenda is already important. The state needs to know that the residents here go to sleep and wake to the sounds of digging." "Sometimes there are military sources who say, 'we checked and there's nothing,' or that it's rats, or that the sounds are in their heads. But today even the army admits that there are tunnels. There are residents who report that their houses are shaking, you can't say that's noise in their heads," said Sofer. State Comptroller Yosef Shapira on Thursday sent Netanyahu a draft of his report on the treatment of the tunnel threat, which found the government has failed in confronting the threat. 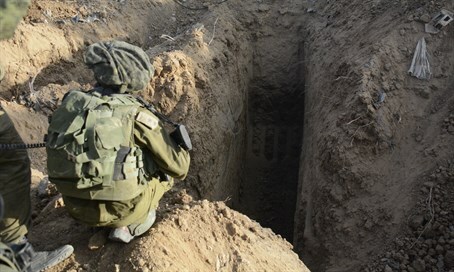 The topic of Hamas's terror tunnels has come back in the spotlight in recent weeks, after three tunnels collapsed in the last two weeks killing 11 Hamas terrorists. Palestinian TV on Wednesday allegedly showed footage of IDF machinery searching for tunnels under the Gazan border.